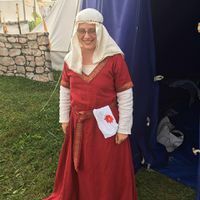 I joined the Society in A.S. XXXV in the Barony of the Jararvellir (Madison, WI) in Northshield when it was still a Middle Kingdom Principality. I moved to the East and the Shire of Panthervale in A.S. XLVI. 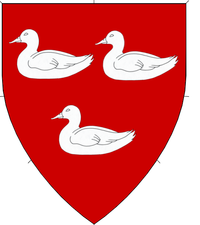 I have several awards for performing arts in Northshield including a Grant of Arms that came with my entrance to the Order of Brigits Flame. In addition to the performing arts, I focus on poetry. I enjoy embroidery, beading, and retaining. I have an abiding research interest in the history of Jesters and Robin Hood legends. I have a myriad of interests. Alienor Hathaway in from Barnsdale, Yorkshire in the early years of Queen Elizabeth's reign. Her mother is French. Her father was a younger son who rose to his position due to an outbreak of the sweating illness that took the whole remaining senior line. Was there a Historic Robin Hood? I love ceremonial occasions and cry easily. I prefer to be surprised. Artisans using their creativity to whatever art they choose is humbling and amazing. I'm an archivist in my mundane life and geek out at historical inspiration and citations. My favorite historical documents begin with "Be it Remembered"